At Saving Energy , we only work with specialists in their fields. Our geyser timer installers are no different. We have sourced the best at what they do. As a result , we are fast , efficient and very competitive. We will respond to your booking enquiry within 24 hours or less and arrange your geyser timer installation to suit your time. A normal geyser timer installation only takes around 20 Minutes , so you can get it done in your lunch hour! How long does a geyser timer installation take? A typical geyser timer installation takes about 20-30 minutes and our installers will test the timer to ensure that you have hot water from your geyser before they leave. With more than 200 successful installations already done and with the Annual Electricity Price increases on their way , there is a solution. 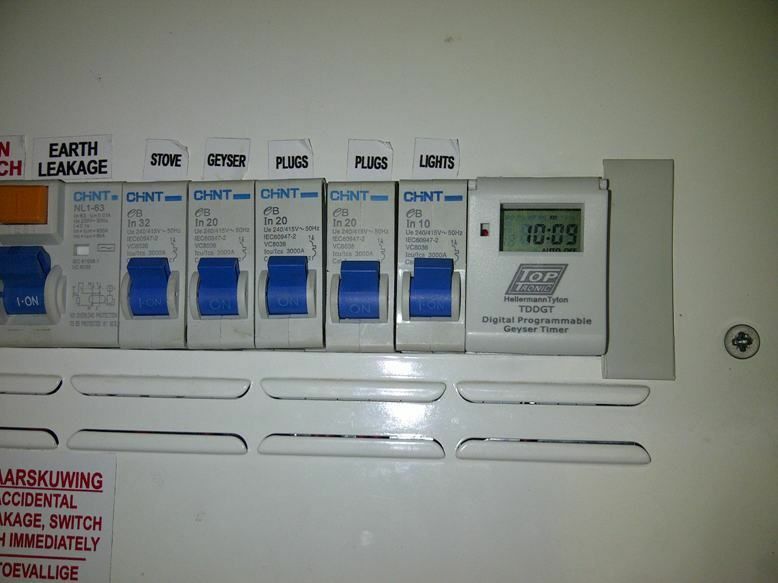 Geyser timers save electricity all year round, so you can cut your electricity and save money by installing a geyser timer with Saving Energy. A Geyser timer installed in a DB Board. Please book your geyser timer installation by filling in the form below and please include your address details so we can allocate the installer in your area. With the impending electricity increase next year PLUS the projected 2%-5% additional increase above the 8% already scheduled, now is the time to invest in reducing your electricity and saving money by taking up this package offer.We have proven results that show a saving of between 25%-40% when using a timer and a blanket together. Save more money on a geyser timer installation by adding a geyser blanket. Maximise your geyser efficiency by adding a geyser blanket. This combination of the geyser timer installation and the geyser blanket has proved itself the most effective way of cutting down the energy use on your geyser. A Saving Energy client in Cape Town, emailed us to say that she had saved 30% on her electricity bill since installing the timer and blanket – and this was done in winter! You can read Jacqui’s story here. With the special combination deal from Saving Energy on a geyser timer installation and a geyser blanket, you too could reduce your electricity costs. Visit our Store and get pricing for your installation right now ! Plus book your installation online! You can get a quote below. Get a quote for your geyser timer installation. If you are only looking for the timer or you have more than one geyser, please fill in the form or click on the buttonbelow. Before you do this , please read our Terms and Conditions here. With more than 200 geyser timer installation projects done across the country, we offer best service and competitive pricing.